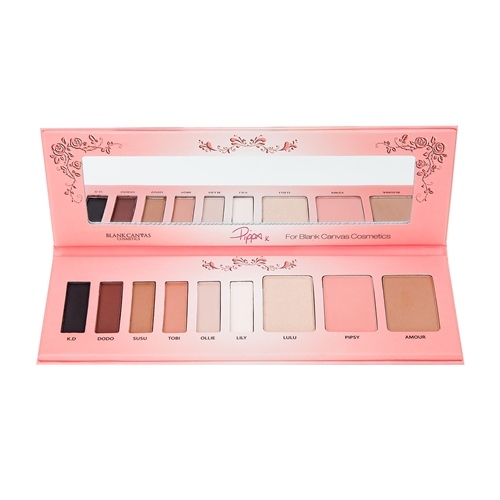 A handbag, travel and make up kit friendly palette-this is a must for make up lovers everywhere! The Pippa for Blank Canvas Palette combines everyday glam and nighttime drama with 6 velvet textured eyeshadows, a highlighter, blusher and bronzer. If you are allergy prone or have sensitive skin, it is your responsibility with beauty products to carry out a patch test by applying the product (around a 50c sized amount) in the inside of your elbow every morning and night for 6-7 days before applying this product. Allergic reaction can show in the form of redness or small bumps and mean you are allergic to something in a product. Therefore patch tests are helpful to try identify which ingredient(s) are causing a reaction so that you can avoid them in other products as well. Whether you are creating an every day, neutral eye look or all out drama for a night out, the Pippa for Blank Canvas Palette can do it all!